Magic: The Gathering is not just a good game. It's not even just a great game. It's an institution that didn't just kick-start a new generation of card games - Trading Card Games (TCGs) or Collectible Card Games (CCGs) - but has seen its influence extend everywhere from board games to the Metal Gear series. Just as importantly, even putting aside all the innovative mechanics and strategic depth, a vibrant, worldwide community has grown up around Magic. The game is currently printed in 11 languages, the tournament scene spans the globe, and community sites have sprung up in every corner of the world. Now this means two things: one, getting into Magic can mean finding new friends and stable playing groups from your home town to the other side of the world, and two, getting into Magic can be... a little daunting. The game has a dizzying amount of history and an intimidating back catalogue, but the good thing is, if you're just getting into the game, you don't need to worry about any of that! So what do you need to think about? Well, that's where I come in. My name's Tom Reeve, and I've been playing Magic for around 15 years. While I've never played on the Pro Tour itself, I've played in a ton of tournaments, run demos for the game, taught friends to play, written and edited strategy articles for Magic and other games, and written and edited event coverage for a few CCGs. Magic, and the people I've met through it, have been a big part of my life, and I currently work full-time for an online Magic retailer in the UK. And I have good news for you - there has never been a better time to learn to play Magic! While getting in on the game early may have had financial benefits as cards from the early sets became more and more valuable over time, Wizards of the Coast has been making a huge effort over the last couple of years to make the game more approachable to new players. The rules have been streamlined, products aimed at new players have become more common and better designed, and electronic versions of the game have finally started to catch up to the real thing. Future articles will go into more detail about specific decks and boxed sets as they come out, to look at how they can be best used by new players, but I'm going to start off with a quick run-down of the best tools if you're looking to learn how to play from scratch. 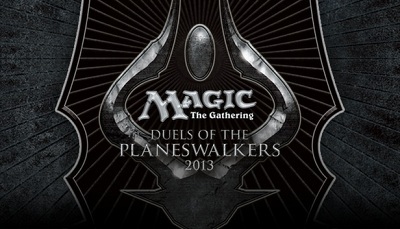 Duels of the Planeswalkers is the gleaming flagship of Wizards of the Coast's Acquisition Armada. Initially released in 2009 and updated most recently only a couple of months ago, Duels of the Planeswalkers is available on Xbox Live Arcade, PlayStation Network, Steam, and now iPad. And while Duels of the Planeswalkers includes a variety of challenges, game modes and puzzles for more experienced players, it's the tutorials, tooltips, and streamlined interface that make it perfect for newer players. You can read more about Duels of the Planeswalkers in Mike Rosenberg's review of this year's edition here. 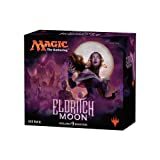 To help encourage players to crossover to real cards, the game even includes a code to submit on the game's website to pick up a special free booster pack, including a promotional version of a Mythic Rare from the Magic 2013 core set. Future articles will deal more with paper products, but if you're a completely new player, this is where I would recommend you start. Although not as interactive and flexible as Duels of the Planeswalkers, the official Magic: the Gathering website has a 'Learn to Play' section, with videos, a downloadable rulebook, and a downloadable demo. If you look over on the left side of the page, there's also a store and event locator, so you can check out if there's somewhere near you that can help you learn. While the website itself doesn't have the level of interactivity that Duels does, or the social aspect of a store or local play group, what it is is a great resource and reference point. Another great reference on the official site is Gatherer, a complete, searchable database of every Magic: the Gathering card. Sometimes you'll find older cards with wording that doesn't make perfect sense under modern rules, and Gatherer can help you out with current rules text. It's also great once you're ready to build or tweak decks, as you can quickly check out, for example, the creatures of a certain colour in the format you're building for. If you don't have a store nearby and you'd like to learn with real cards and some friends, then there are a lot of options. Wizards of the Coast now produces a whole range of Magic products, from the good old booster pack to limited edition deluxe products such as From the Vault and Commander's Arsenal. Ever since the release of the Tempest set in 1997, pre-constructed decks have been released with each set to give players a look at the set's mechanics in action. 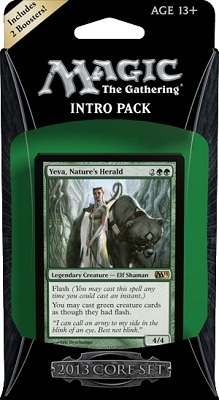 While the name has changed from Theme Decks to Intro Packs, they have always been a great entry-level product. And I have some good news for you! They're a better buy now than they've ever been, as the most recent versions include two booster packs along with the deck, giving you the chance of opening something awesome, and encouraging you to think about your first tentative changes to the deck. For an absolute beginner, I'd recommend picking up one or two of the Intro Packs from the most recent Core Set. Core Sets, with the most recent example being Magic 2013, provide a relatively simple baseline experience, without all of the craziness and more complex mechanics that turn up in the expansion sets. That means the Intro Packs from the Core Sets are that little bit more straightforward, and will give you a smoother learning curve as you get used to the rules. This almost doesn't seem worth mentioning, as it's the first thing most people would think of, but it's worth making the point. If you have gamer friends but aren't sure if they play, why not drop a quick Tweet or Facebook status update to find out? You may already know Magic players, or you may know other people who would be interested in learning with you. Magic, for all its incredible depth as a game and near-infinite variability, is a social game at heart. It was originally conceived as a game that could be played quickly in breaks between longer roleplaying and war-gaming sessions, and while the online version of the game has become incredibly popular, that social element is still unique to the physical game. Teaching yourself to play is certainly possible, but learning with the help of an existing player or group, or learning alongside one or more new players, will both be a lot more fun and a lot quicker. If you're part of an existing gaming group, odds are that some of them have at least played in the past, but even if they haven't, why not pick up a couple of Intro Packs and get stuck in? If you're still on the fence about whether Magic is the game for you, I would say two things. First, what do you have to lose by giving it a try? Even if you never buy a booster pack, Duels of the Planeswalkers is a great buy just for the single-player campaigns, puzzles and game modes. And the second thing is what you have to gain. The size of Magic's community, and the breadth of the casual and tournament scene, mean that there really is something for everyone, at every level of play. Whether you just want a new game to play around the kitchen table, somewhere to game on Friday night, or to dive headfirst into the competitive scene and travel to far-flung places, Magic has something for you. There are written articles, podcasts, recorded videos and livestreams aplenty, and many of the larger events now have streaming video coverage with full commentary, and with Magic Online you can draft, test out decks, or even qualify for the Pro Tour from the comfort of your computer chair. So take the plunge, and I'll be back with more tips for starting out with Magic. 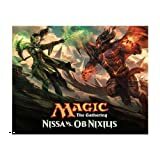 Over the coming months I'll be looking in more detail at some of the pre-constructed decks that are ideal for those looking to make the jump to their first tournaments, at the differences between the various tournament and casual Magic formats, and at some of the basic principles that you'll find useful when you want to start building your own decks. And of course, if anyone has requests for topics to be covered, please let me know in the comments and I'll see what I can do!